Home Holiday Catalog The Holiday Catalog is HERE!! The New Stampin’ Up! Holiday Catalog is HERE!!! It’s the best time of the year!! 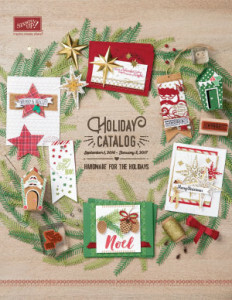 The new Holiday catalog is Here and it is fantastic! I can’t wait to show you more ideas with the catalog. There are so many pretty things in this catalog that I can’t decide what to work on first. And even better – Stampin’ Up! is bringing back weekly specials for the first three weeks of September. You can check them out HERE. Ready to place an order? If you order is under $150 then use the Hostess Code 7KQJMK2R and I will share a ribbon sampler of the new In-color ribbons with you! Of course, if your order is over $150 then collect the hostess benefits for yourself!